We should be celebrating Alexander’s 5th birthday today. Instead of eating cake and ice cream, I’m spending part of the day working on planning for the 3rd Annual Alexander’s Run. Though he doesn’t understand me, I’ll talk to Daniel about his older brother and how much I wish they had been able to grow up together. Instead of Alexander blowing out 5 candles on his cake, we’ll go to the cemetery later and release 5 balloons. When I looked into Alexander’s eyes 5 years ago at the hospital, this isn’t how I thought I’d spend his birthdays. I’m glad I have happy memories to keep me going on these tough days. 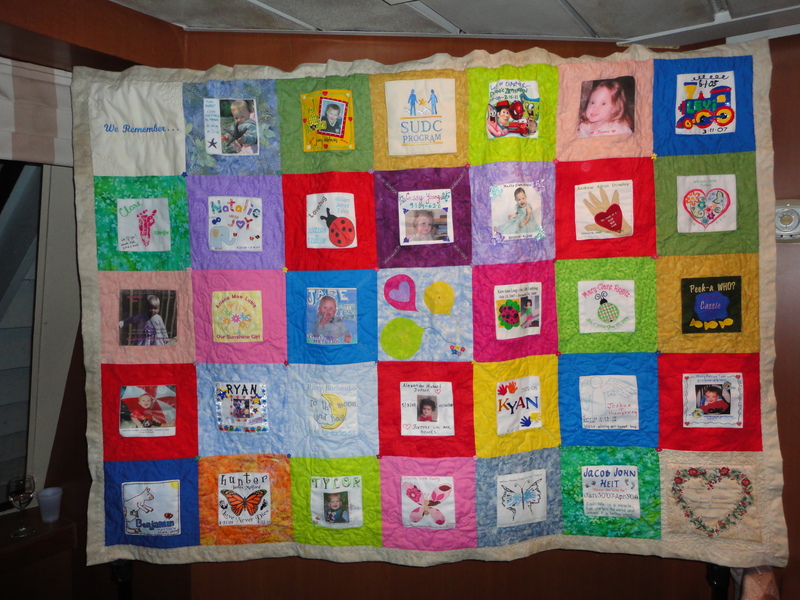 The recent SUDC quilt was unveiled at the 10th anniversary event on April 14. I’e never done a quilt square until now. My square isn’t very creative but it is from the heart. I’m glad I was able to include Alexander along with the other children. Dan, Daniel and I went to dinner at the club on Wednesday evening. As we were leaving, we stopped to say hi to friends who were seated at the bar. Along with our friends, there was another couple siting nearby who commented on Daniel. Their first grandchild is the same age. After our friends left to be seated for dinner, we continued to talk to the couple sitting at the bar. Of course, the inevitable question comes up about is this our first. I quickly no. The wife pressed and I finally told her about Alexander. To my surprise, she responded that she understand my pain because they had lost a daughter to SIDS many years before. She also surprised me by thanking me for telling her about Alexander. The wife and I chatted a while more about our children. It was nice to have this conversation. I guess you really just never know what another person has experienced in life. At the SUDC fundraiser, I did tell a couple of parents that I try to tell our story whenever I can. It’s one way to keep talking our sweet Alexander but also part of raising awareness about SUDC. Even though, presently, there is no way to prevent SUDC, I feel I do need to tell people about it. Dan and I attended the SUDC program’s 10th anniversary event in NY this past Saturday. On the one hand, it was wonderful to meet some of the parents I’ve only known through the online support groups. On the other hand, the reason that brought us all together made me sad. I don’t know what we would have done if the SUDC program hadn’t existed when we needed it. Despite being surrounded by family and friends, I felt so alone during those first days after Alexander passed. Time has helped decrease the intensity of my pain but I still miss Alexander so much. I’d forgotten how exhausting a newborn could be. Alexander’s younger brother, Daniel was born November 17 and has been keeping me very busy. I barely have time to sleep much less do things like update my blog. I’ve been so tired, I don’t think I’ve really had a chance to process my feelings about Alexander’s anniversary. It’s hard to believe Alexander has been gone 3 years. On his anniversary date, we spent a quiet day at home and went to cemetery in the afternoon. Recently, a friend asked me if it gets any easier. I told her I don’t think it gets easier. Alexander’s loss has become part of me and is something I must deal with on a daily basis. Some days are better than others. Now that Daniel has arrived, I’m trying to find a balance between being happy for the child that I have here with me and being sad and missing the child that is gone. I talk to Daniel about Alexander and we look at pictures of him. I think Alexander and Daniel would have been great friends and I wish my boys could have grown up together.